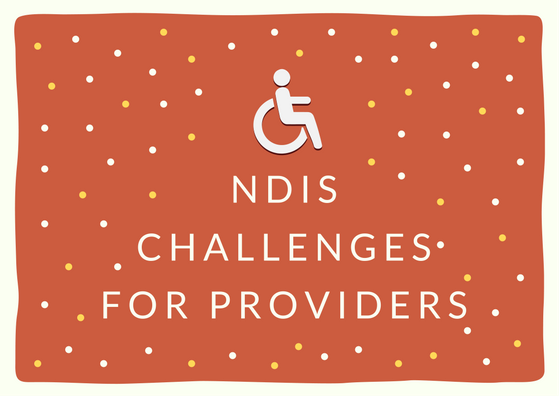 The NDIS presents a new set of challenges for providers. These challenges are primarily in the funding scheme. Under the NDIS, providers will receive payments for the services they provide, after they provide it; similar to the system used for many healthcare providers. However, for services that have historically received their payments in bulk before a service is provided, this is a change that requires adjustment; from a “funding” model to a “marketing” model. This introduces market forces to the sector. Customers are the centre; they choose who to hire and fire. Providers must be frugal in their allocation of resources, and must ensure they are sustainable. The NDIS has published a price list to be used as a guide for providers when determining the cost of their services. Effectively, the NDIS is the Medicare of the disability sector. A pricelist has been developed that they will help patients pay, however ultimately it is up to each individual provider to determine the services they will provide and at what cost. Are the organisational strategy, goals and outcomes aligned to preparing for NDIS and individualization of funding? If not what actions are required? How well is the organisational strategy, mission and vision known by staff and how is it reflected in organisational practice? What are you known for now – do you have a specific niche market or are you a generalist provider? What supports do you want to provide in the NDIS environment? What are your points of difference from other organisations? Why would people choose you over another provider? How well is this known by your staff? What services do you currently provide that are not your strengths and are there any that are currently unsustainable? If inefficiencies exist, changes need to be made before the NDIS impacts your business. Although it’s unfortunate that WA will be the last state to rollout the NDIS, it also means we have the capacity to learn from similar providers that have experienced the challenges NDIS introduces. I encourage all providers to research providers of similar services to identify any potential difficulties you may encounter. If you need assistance with any of these steps, we can help you. We provide Business Process Mapping, and can work with you do develop new processes. Furthermore, we provide Automation of some systems. Contact us if you wish to discuss this further, or meet to explore your options with us.